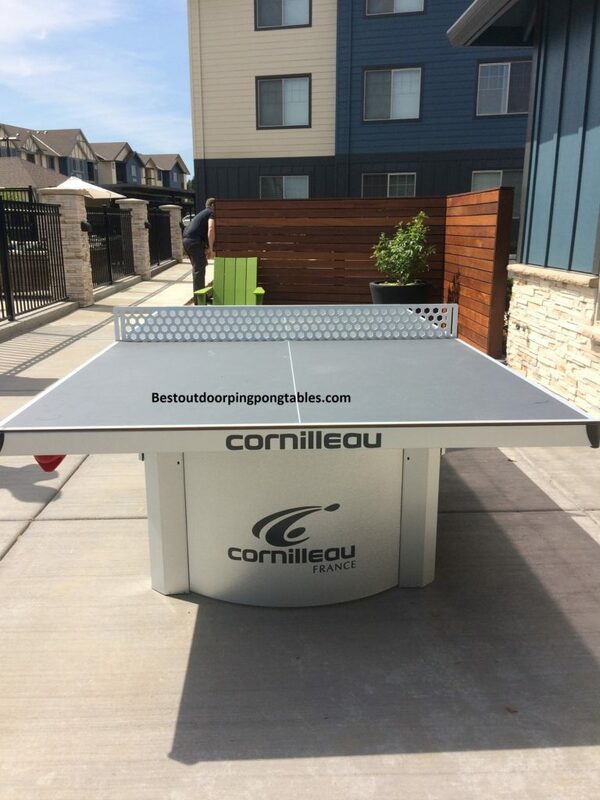 The Cornilleau 510 Pro Stationary ping pong table is designed for use in commercial situations. We’ve seen dozens of these tables go up in parks and upscale apartment complexes around cities like Seattle, Portland, and San Francisco. You can literally bolt them to the ground and secure them into place. 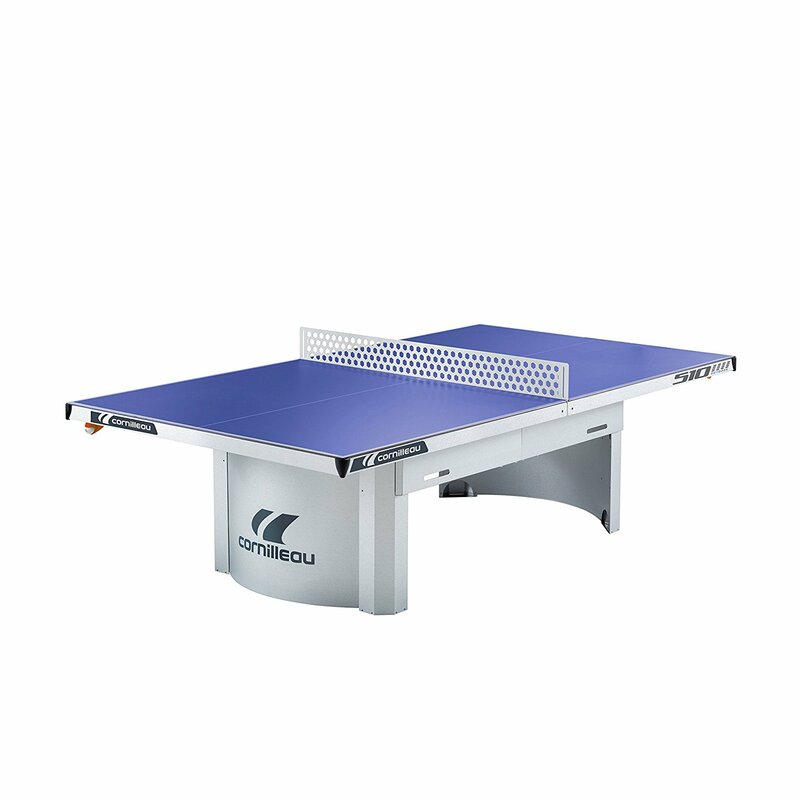 The Cornilleau 510 Pro outdoor table tennis table has an industrial design that is meant to withstand both the weather and constant use from players. Our experience with the table has been amazing. In the photo below you can see we had a beautiful sunny day to play around on the table with some friends and ‘take it for a spin’. 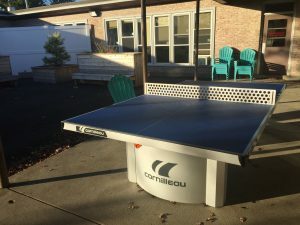 At $1750 it’s perhaps the most expensive outdoor ping pong table you’ll find besides the Cornilleau Park Outdoor which retails for over $4500 and could last 20+ years without any issues. Frame/Design – Let’s start with the most impressive aspect to the table, the stylistic curved leg design. The 2 1/4″ structural galvanized steel frame is scratch and corrosion resistant. That’s one reason these tables are being purchased by parks and recreation programs around the United States. They can last outdoors for years and show no signs of wear and tear. Safety is not really an issue since the table doesn’t fold up to playback or storage mode. We do like the corner protection pads (we have a photo below) since they help little kids from getting hurt while running around the table. With more of an open frame design to the table, I can see how kids might want to climb underneath the table and play around. The metal pieces on our table were not sharp, but something parents should watch out for. Playability – You get the 7mm resin laminate top, the same as the Cornilleau 500M provides. 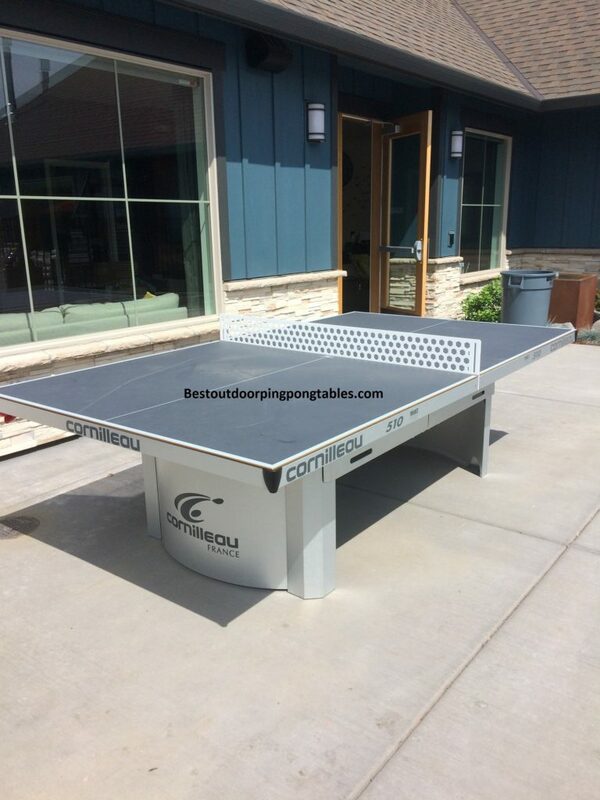 The top is very dense and hard which gives you the best outdoor ping pong bounce on the market. 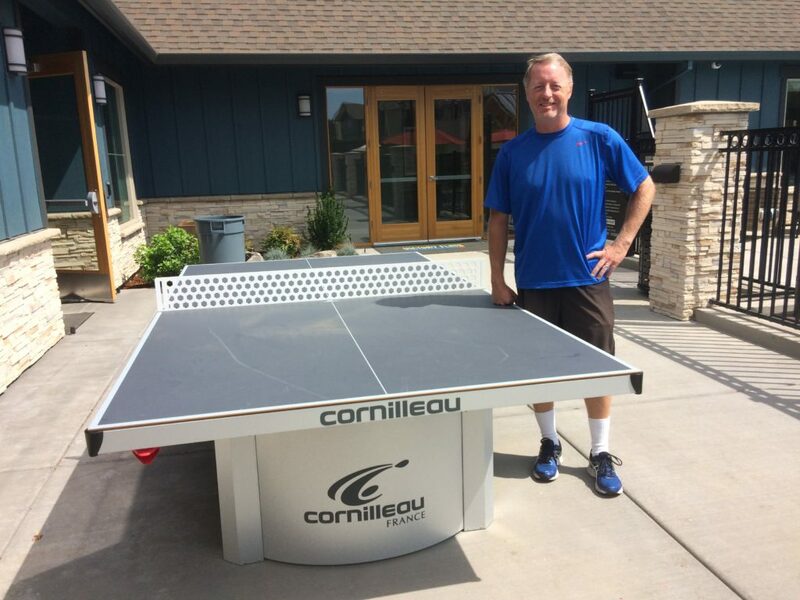 The ITTF approves of the bounce standards on this table – not an easy accomplishment. The MATTOP Finish is another feature that the Cornilleau table offers – no glare from the sun as it reduces the reflection by 10X’s. The Cornilleau 510 Pro Stationary is approved for competition which means you’ll find them in table tennis clubs, schools, and local ping pong tournaments. We found the bounce to be near perfect on our table, although playing outdoors does mean that the wind can effect shots so beware. Storage – There is really no need for storage on this table as it’s been designed to stay outdoors 365 days a year no matter the weather conditions. 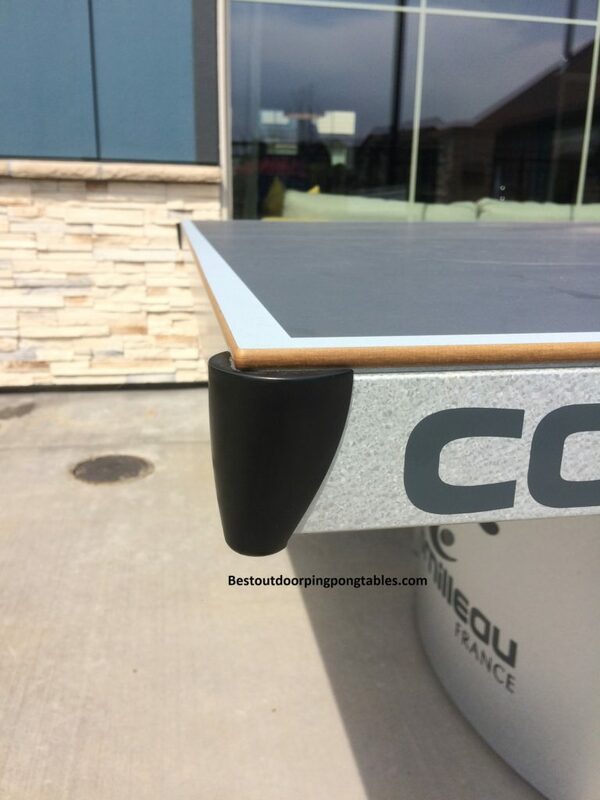 If you want a high end outdoor ping pong table that can be stored away, consider the Cornilleau 500M which can be folded up and put into storage somewhere. You should buy a cover for the Cornilleau 510 Pro Outdoor just to keep it from getting dirty. 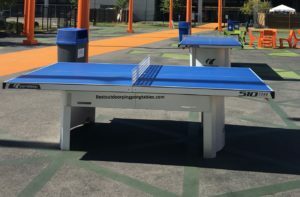 We’ve seen these tables in parks up in Seattle and in their Chinatown district – they are secured to the ground and people are allowed to play on them all year. They are virtually indestructible. 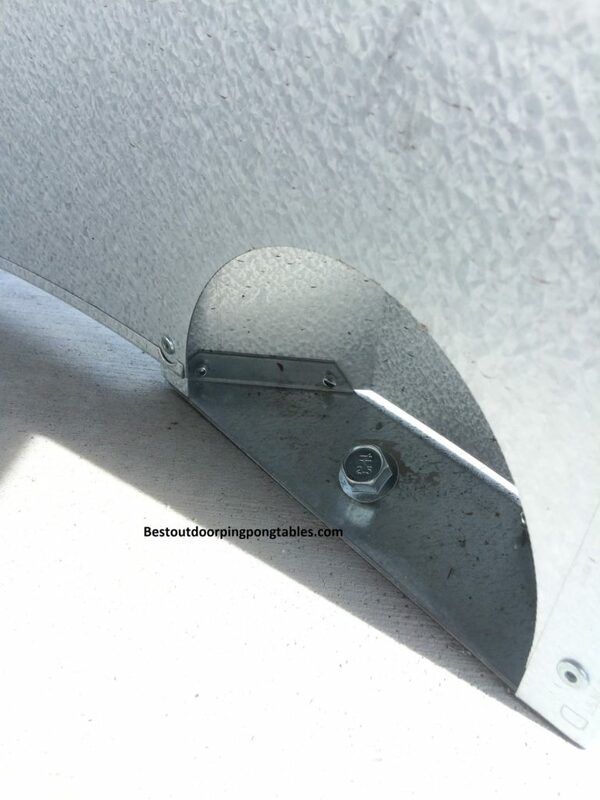 Additional Features – The tamper proof steel net will last a lifetime and I realize why many people go with that option if they are going to put the table into a public area like parks or resorts. Personally, I would buy the standard net kit which is optional. The regular net makes for much more fun playing conditions. I have played on the Cornilleau 510 Pro Outdoors many times and never had a ball hit the steel net and bounce over. The steel net rejects every ball that barely hits the top and ricochets it way off the table. You can adjust the regular mesh net for height and tension. 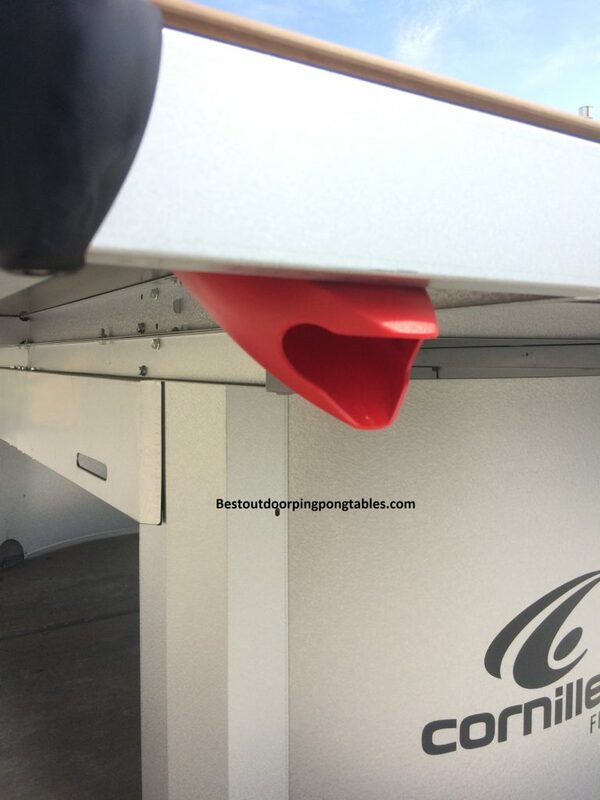 There is a holder for your bats (paddles) on both sides of the table – storage for up to 4 ping pong paddles. The ball dispensers are very similar to those found on the Cornilleau 500M – right at the end of the table where they are convenient for players to retrieve new ping pong balls anytime. Positives – The clean, yet elegant design makes this a real conversation starter at parties and neighborhood gatherings. The 7mm resin laminate surface with the MATTOP Finish works great outdoors. The weather resistant materials will definitely help this table last for a decade or more per their warranty. It’s even wheelchair friendly. Drawbacks – Again, the price on this one at $1750 is a bit of a shock. 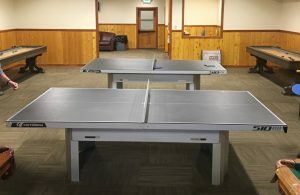 We assume most people buying this table are planning on using it in high traffic areas like parks, resorts, cruise ships, or community centers. If you are getting it for home use, consider the Cornilleau 500M or the 400M as those are better for residential use as they actually can be folded up and put away into storage when needed. The steel net is just ridiculous in my eyes and not needed unless in an environment where someone might steal the net off the table.